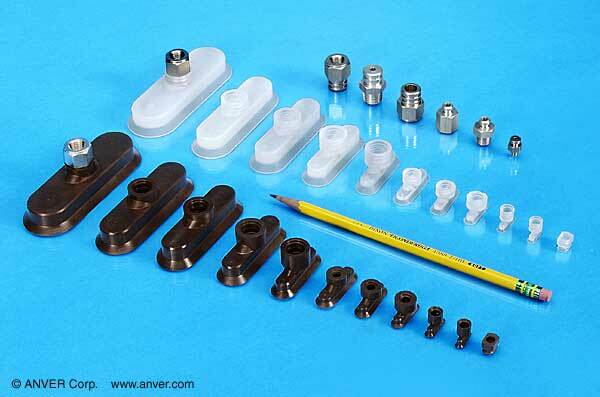 ANVER stocks a large variety of small oval vacuum suction cups to suit your vacuum lifting needs. Our Small OC Series Vacuum Suction Cups are best suited for handling small round or cylindrical oblong surfaces such as pens, tubing, or bottles. These vacuum suction cups are available in numerous sizes and materials for use on many small item material handling applications. The cups are listed with the appropriate Series 1 or 2 fitting and Level Compensators on the right. Each fitting has a number of Level Compensators available. The Level Compensators needed for these cups are ANVER “NR” non-rotating type. This keeps the cup from spinning out of position. Click on the image and it will take you to the pages. The standard materials are Nitrile (NBR) and Silicone (SIT). The “G” thread is also known as BSPP, commonly used world-wide for vacuum applications.